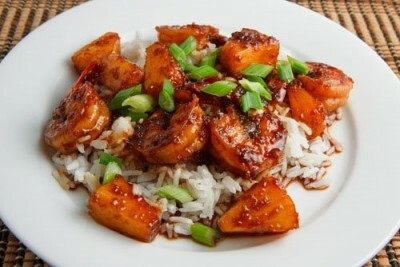 Marinate the shrimp in the teriyaki sauce and pieapple juice for 10-20 minutes in the fridge. Heat the oil in a pan. Add the shrimp and saute until cooked, about 2 minutes per side and set aside. Reduce the marinade by half in the pan. Add the pineapple and heat. Remove from heat and mix in the shrimp and sesame oil.